Site created and maintained by Rick's Web Solutions. 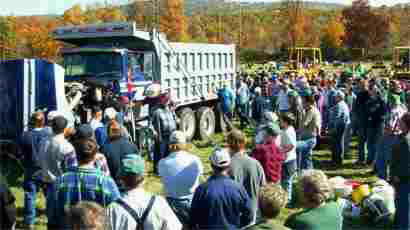 Rentzel’s Auction Service, Inc. has been serving York County, PA and the surrounding area for over 50 years. Whether you are selling real estate, farms, antiques, farm equipment, collectibles, machine shop or construction equipment, settling an estate, or moving, we are here to be of assistance to you. Rentzel’s will market your property to get as many buyers as possible to the auction. Once we have the buyers there, we run a fast pace and exciting auction, getting you the highest dollar for your real estate and/or personal property. Owner and auctioneer Dave Conley has over 20 years experience in the auction business and was the 2007 Pennsylvania Bid-Calling Champion of the Year. He would be glad to help you through the auction, from pre-auction setup through auction day. Rentzel's will assist you in deciding what is sellable and what is not sellable. Composing an auction ad, taking pictures of and marketing your items, and helping prospective buyers with questions on real estate and personal property are all services that Rentzel's specializes in. We offer options of both onsite auctions or moving your items offsite and selling them at another facility, usually the John and Paige Smith Center, conveniently located at the York Expo Center (York Fairgrounds).